Signature Arts, Inc.: Come on Upper Deck!!! Really? Come on Upper Deck!!! Really? 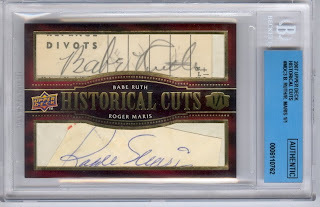 Just look at the Maris autograph on this card. I would never offer this type of autograph to my customers. Parts of letters missing all over the Maris autograph and you can have it for only $20,000 on ebay (or make an offer). This is something the card companies have done to create chase cards. Obliterating autographs seems to be a fun thing for them to do. This really should not happen. Even Beckett has criticized the card manufacturers for this practice with this statement: "Many auto cuts of late have been mis-cut, not fitting on the card, and simply, not of top quality presentation." This is a wonderful comment by Beckett on the sad state of these cards. I don't know of any serious autograph collectors who buy these obliterated cards. News in the Authentication World!